SIMI VALLEY, CA -- Getting lost in the mountains -- it's something Park Rangers caution us against, because of the potentially severe consequences. The prudent person heeds such warnings and packs for any eventuality -- extra food, water, batteries and a compass -- just in case. In other words, the Rangers tell us the high altitude environment can be cruel to a human being -- either that, or our survival instincts just aren't very good. But there are times when feeling lost wouldn't be so bad, when you need an escape from the everyday hustle-bustle of our normal existence. And at other times, being lost is actually desirable -- like on a golf course. 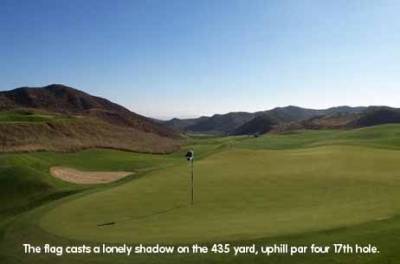 That's the feeling you get at Lost Canyons on its Shadow Course. The Shadow Course works its way away from the clubhouse with your first tee shot, and doesn't return until the final putt drops on eighteen. 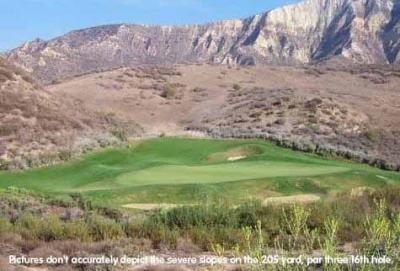 In the interim, you'll make a trip down and up Dry Creek Canyon, and once you've reached the eighth green, you're as far away from the safety of base camp as you're going to get. As it turns out, the creators of the Shadow Course wanted it that way. Rick Adams, Head Golf Professional at Lost Canyons, expands on the notion: "The whole idea behind our name was to let people know our property's kind of secluded--and that you get the feeling you're lost at times. Even as you drive into the parking lot, the minute you get out of your car, tall mountains surround you. It's a wonderful, yet intimidating presence." Adams continues, "And then when you make your way into the canyons, sometimes you won't see anything except the green grass of the hole you're on. It gets kind of spooky out there if the time of day's right, the shadows are long and there's a little bit of a breeze blowing -- especially on the Shadow Course." According to Adams, it's going to stay that way -- even when some houses are built. "There won't be any houses along the fairway. We do have about a hundred homes sited throughout our 1700 acres -- and there're a few holes where you'll see houses from a distance, but it won't be anything like condos right up to the course. You won't be able to snap hook it hard enough to get to 'em." He's never seen some of my finest work, or maybe he'd revise his estimation. But he's got a point on the seclusion -- it's nice to be 'lost' when at some other golf facilities, it seems like just the opposite. "I think if you're going to go out and play golf, you shouldn't be bothered with flight patterns and freeways and people and housing, or construction. That's something we don't worry about here," Adams adds. Unfortunately, due to the difficulty of the golf course, you might feel a little lost in your golf game. The Shadow Course is the second classic Pete Dye/Fred Couples layout that opened at Lost Canyons, and it's pretty demanding. Whereas the Sky Course is fairly wide open off the tee and will grant you a break at times when you hit one astray, the Shadow Course isn't nearly as forgiving. There are healthy native vegetation boundaries on most holes, so when you miss the green stuff, you might as well reload. I will say, grabbing for another little white ball for the next try isn't nearly as painful when you've got a forecaddie finding all you'll ever need. Our caddy, Mark Kiernan, not only performed his 'regular' caddy duties--suggesting the proper distances to hit, offering tips on reading greens and spotting tee shots -- he also fearlessly attacked the weeds in search of our numerous wayward shots. Snakes notwithstanding! Some he found, some he didn't -- but he never failed to grab a pocket full when he went in there. Worth the price of his services and gratuity alone! In addition to the serious test off the tee, the Shadow Course's putting surfaces are smaller than the Sky's. Kiernan advised us to start off with the concept that putts are straighter than they look, and he was right. The A4 bentgrass greens certainly roll, though, so merely gauging the line won't always guarantee a good putt. If the speed's not right, you're leaving yourself plenty of testy comebackers. It's all part of the challenging package. But Adams says to expect that when you play a Pete Dye course. "Not many people come in here after their rounds saying it was easy out there, but the vast majority of people enjoy the challenge. 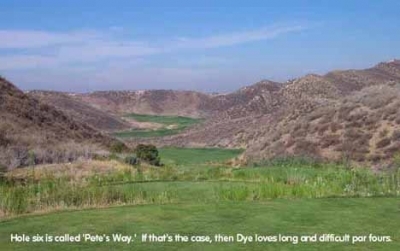 Pete Dye builds exacting courses, but they're fair enough where people want to come back." Variety will also leave you craving a return. The terrain is so varied on the Shadow Course that most every hole gives a unique look -- and will even play quite different based on tee and pin location. A bunker that might not be in play one day will suddenly wear out the rake the next. Throw in the 'act of God' features, such as wind direction and severity, and you've got a completely new golf course the next time. Adams pointed to the par threes as especially well done on the Shadow Course. They definitely play to different lengths, topography and difficulty. Having played a great deal of Mr. Dye's work this year, he certainly deserves the award for best and most creative par threes -- perhaps crowned by his work right here at Lost Canyons. As a final note before I describe some of the layout, the conditioning of both courses deserves special commendation. Both the Shadow and Sky courses are only a couple seasons old, yet present the looks and playability of courses having been around much longer. The tees, fairways and greens are in outstanding shape, the rough is thick, and the bunkers' sand is richly textured. You'll also take the carts in the fairways without feeling like you're damaging the delicate conditional balance of a new golf course. Kudos extended to Lost Canyons' Superintendent. Dye begins the Shadow Course with an uphill, 310 yard par four. The driving area looks wide, but a bunker waits to the right-center of the fairway within driver range. You may want to club down right from the start -- to get it in the fairway and calm your nerves. Two is named 'the edge,' and it's easy to see why. The first of the four excellent par threes Adams is so proud of, it plays 185 yards from the back tees and seems to sit on a ledge. There's a bunker to the right of the green, but anything lost to either extreme is forecaddy fodder. Four is another excellent par three, 200 yards in length and named 'big sky.' After hitting to the green, you'll see why -- as the ball looks like a tiny white dot disappearing into a humungous blue sky. Beautiful view, challenging hole. Six is the Shadow's #1 handicap hole, probably because it's got the most intimidating view from the tee boxes (and believe me, there are many intimidating tee box looks). Shooting down a canyon, you play to a partially hidden fairway. The second shot's no gimme either -- a long iron or fairway metal into a slightly elevated green with four large bunkers to the right. Nine's a nice par five, 550 yards and a gradual uphill journey. The tee landing area's extremely wide on this hole, leaving most of the challenge for the second shot. 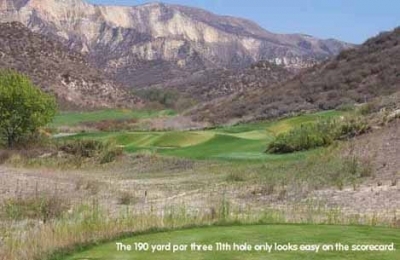 The Dry Creek runs diagonally from left to right up towards the green, giving the hole a definite risk-reward quality. Plenty of room to the left to layup, or go for the green and ford the creek bed, it's your choice. Eleven's a deceptively difficult par three, 190 yards in length, with a green surrounded by trouble. 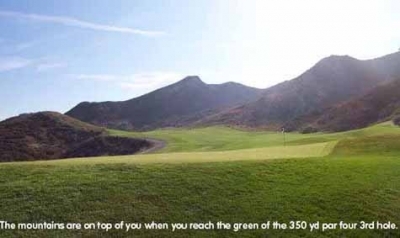 Keep the ball to the right side, as you may get a generous kick off the slope onto the undulating green. Certainly better than going left into those Dye sand monsters! Thirteen's a terrific short par four, 335 yards in length but straight uphill and a dogleg right. Accuracy's more important than length off the tee, but Dye puts a bunker right in the middle of the fairway 200 yards from the tee to tempt you to drive over it -- otherwise, the second shot will be incredibly difficult -- a long iron to an elevated, undulating green. A traditional outstanding Dye closing sequence awaits in sixteen, seventeen and eighteen--pars three, four and five respectively. Sixteen's a 205 yard par three with a deep but very sloped green, protected by bunkers front and right as well as long and left. Here's a hole where pin placement is key, because you'll want to play to the green's slope, not the flag. Seventeen is a medium length par four (435 yards!) that leads uphill the entire way. The green on this hole is especially notable -- if you miss right, there are large bunkers and deep rough -- and the green sits on top of a plateau from down there. It'll require great touch to even hit the green from that location. Eighteen's a Dye classic closing hole. Looking at the yardage, it only measures 520 yards -- but the tee shot's straight uphill. Chances are, you won't be able to see the green in the valley below for your second, so take your caddy's advice on what distance to hit to. A very challenging, plateau green calls for an accurate third shot to have a chance to take a stroke away from the Shadow Course on the last putt. Finishing up, you've re-entered civilization. Lost Canyons' excellent clubhouse is clearly within view, and it's a short ride back to where the people are. You haven't been lost while you've battled this Dye classic, but you definitely feel like you're 'rescued' when you complete it! Mon-Thurs, $95. The forecaddie is now optional -- $15 per player, plus gratuity. Fri-Sun, $120. Again, forecaddies are an additional $15 plus gratuity. Reservations taken up to 30 days in advance. Three day advance reservations required for forecaddie.